Minimalism: Do You Need To Buy It? | Alyssa J Freitas: Minimalism: Do You Need To Buy It? Minimalism: Do You Need To Buy It? I've always been one who loves to throw things away; I actually get a sort of high whenever I clean out a part of my room. As I've been ramping up my efforts to have less things I realized that, yes cleaning out is important, but what is more important is keeping it that way. Enter: not buying new stuff. Who doesn't love shopping (if you don't, please just refrain from answering so I can make my point. Thanks.)? I know I do, especially when I find things that are just oh my goodness so perfect for me I must buy all of the things. The problem with wanting to get new stuff is that it is somewhat incompatible with the new lifestyle I am pursuing (hello, minimalism). Here's a great example. I have a backpack I have been using since my sophomore year of high school which means I am entering year five of using it. It is stylish, fits everything I need, and is totally unique. Since I've been using it for so long, it is getting worn out and I've had to sew it multiple times. I went to the Target the other day and spotted a backpack that was similar and was like "This is great! Perfect replacement backpack!" However, as I continued walking around the store I wondered if I really needed to buy a new bag? Mine is still in relatively good condition and just needs to be sewn in one or two places. No doubt I can last two more years with the bag I currently have so why would I waste the money and fill up space with something I don't truly need? Then, I started to think about all the stuff I have bought over the years and ended up throwing out in one of my cleaning sprees. If I don't fundamentally change the way I make purchasing decisions, this cycle of waste will only continue. I've identified some ways to effectively combat the urge to buy more so I thought I'd share them with you today. 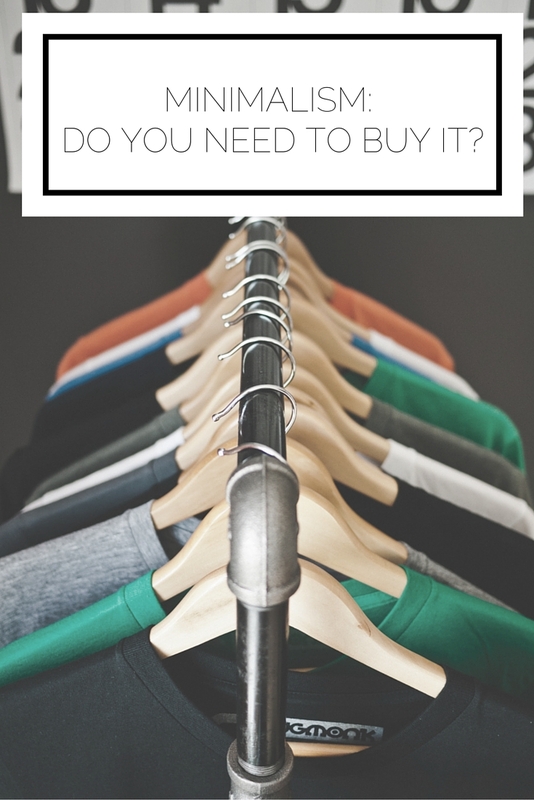 Before making any purchase, at all, ask yourself if you have something similar. There is no need for duplicates and when you pause you may realize that you don't really need it. Ask yourself if you can do without. You probably don't need another shade of red nail polish if you're being honest. Would you be upset a week from now if you didn't get it. Sometimes I'll imagine how I would feel if I waited to purchase it and a week from now the item was sold out. If I wouldn't miss it then I can walk away happy without it. Determine if you'd rather use the money towards an experience, rather than a physical possession. Something I have made a conscious effort in doing is spending on experiences, not things. This contributes quite well to a minimalist lifestyle and truly makes me feel more fulfilled! Asking yourself these questions and evaluating every purchase can help to maintain your minimalist life instead of adding more clutter. I hope these tips help! Read more minimalism posts here.